The lacking awareness of healthcare providers bears the risk of delayed or false diagnoses in rare diseases. No systematic data about misdiagnoses of Moyamoya angiopathy (MMA) are available. To evaluate the rate and pattern of missed diagnoses in MMA. Retrospective analysis of a consecutive case series from a single German referral center. Rates of missed or delayed diagnoses in Caucasian MMA patients were calculated based on discharge letters from other hospitals and systematic chart review. Out of 192 Caucasian patients eventually diagnosed with MMA at our center, an initial misdiagnosis was identified in 119 patients (62%). The time between onset and diagnosis was 1 year in 24 patients, 2 years in 23 patients, 3 years in 10 patients, and > 3 years in 49 patients (mean 5.28, median 3, standard deviation 5.11, and range 4–26 years). 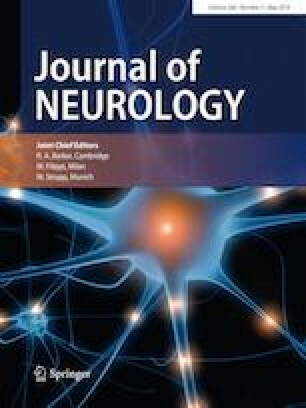 The most common misdiagnoses were cerebral vasculitis (31%), etiologically ill-defined stroke diagnoses (30.2%), and MS (3.6%). This is the first systematic report which shows that patients with MMA are at high risk to be falsely diagnosed and treated. Depiction of typical vascular abnormalities in angiopathy is essential. Normal CSF cell counts, negative oligoclonal bands, and lack of infratentorial lesions as well as gadolinium-positive T1 lesions on MRI may be red flags differentiating this vasculopathy from vasculitis and MS.
Jonas Graf, Jan Claudius Schwitalla, Orhan Aktas, and Markus Kraemer contributed equally to the manuscript. This work is dedicated to our deceased neuroradiological colleague Dr. Petra Schooß (1969–2016). The authors are thankful for the cooperation with the Department of Radiology and Neuroradiology, Alfried Krupp Hospital, Essen, Germany. They did not receive funding for preparation of the manuscript. Authors report no conflicting interests. This study was approved by local ethical committee.